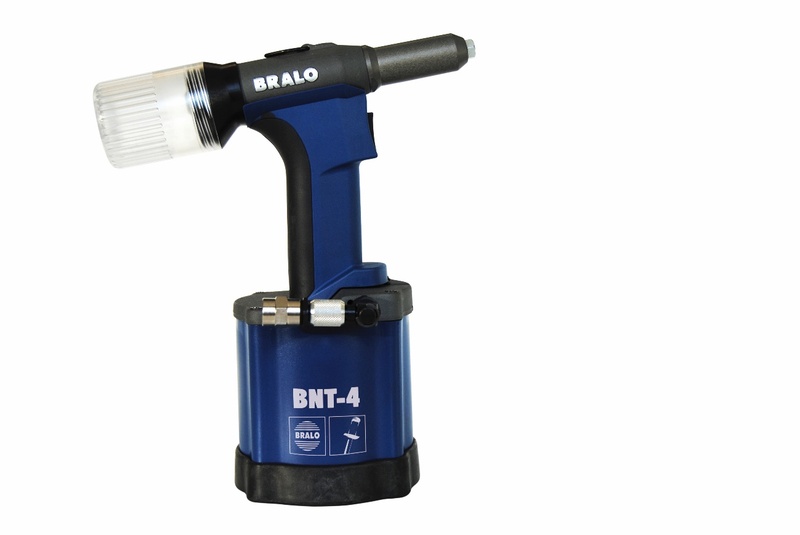 The Bralo BNT-4 is a powerful, ergonomic tool, with an efficient setting system, designed to meet the needs of the most demanding of applications. It is a riveting tool capable of setting a wide variety of blind rivets of different diameters at high speed. It is ideally used in assembly lines and in the setting of applications using large numbers of rivets. The main body is manufactured in a high density cold stamping aluminium. Riveting capacity up to 6.4 mm, 6.4 Hardlock rivets and 7.5 S-Trebol rivets. Ergonomic handles that facilitate the riveting process. Fixed, highly resistant rubber base. High sensitivity in the trigger. It is provided with a mandrel collector that is easy to dismantle, which contributes to the cleanliness and safety of the working area. The multi-position air output deflector prevents the particles from being projected to the worker. Provided with a hanging ring. The compressed air used for the riveting process is recycled for the machine recovery. It is an economical and environmentally friendly solution that facilitates and accelerates the riveting process. Solid, ergonomic and effective tool.